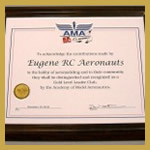 For a 10% discount and free shipping, mention that you are a member of the “Eugene RC Aeronauts” when ordering. We are a designer and manufacturer of Low Cost CNC hot wire foam cutter for cutting wings, RC models, logos etc. TruTurn – to provide prize awards for our events.